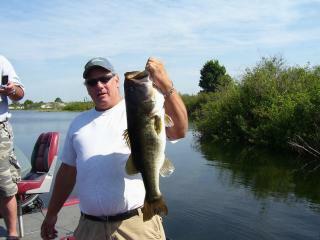 Enjoy fishing for Large Mouth Bass on a picturesque 65-acre private lake. With a skipper taking you to the best spots and your ticket including rods, reels, bait and soft drinks, all you have to do is sit back and wait for a bite. Large Mouth Bass are famous for their size and fighting abilities and thus, are a great challenge for first-time fisherman and experts alike... as you'll discover on this relaxing fishing trip. Heading out on to a picturesque, private 60-acre lake, your boat will have everything you need to make a catch (rods, reels, hooks and baits) including an experienced skipper who knows the best spots to cast off. Apart from the abundant Bass, the lake is also stocked with other fish including Croppies, Snook and Bowfin meaning you have a good chance of ending the 4-hour trip with an excellent souvenir photo of you and your prize to show the Grandkids. You will spend around 4 hours on the water and since you are in your own private boat, you can fish in as many different spots as you choose so get ready for some rod-bending excitement. Location: Kissimmee, just off route 27 at the end of the SR-192. The location is a 20-25 minute drive from Walt Disney World. PLEASE NOTE: Prices are per fishing boat not per person. There is a CPR policy (catch photograph and release) so no fish to take home but, plenty of good fighting fish available in this well stocked and managed clear water lake. Fishing License: Florida Law stipulates that anyone fishing must have a Florida Fishing Licence or a Non Residents fishing Licence. The cost of the license is included in the ticket price and will be provided upon arrival.